The QTU State Council of 19 May saw the Queensland launch of the national Fair Funding Now! campaign. 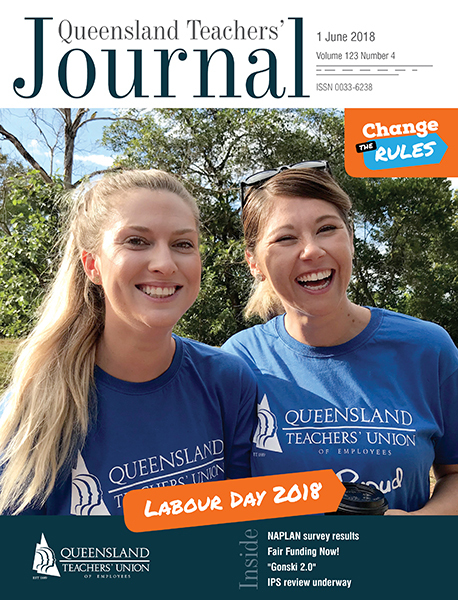 By the time you read this editorial, the QTU and its members will be campaigning for fair funding either in a by-election in the federal seat of Longman (based around Caboolture in South East Queensland) or in a number of target seats across the state as part of a general election. Queensland state schools, their teachers and students have been robbed by the national system of education funding. We campaigned hard for six years from 2007 to 2013 to secure a sector-blind needs-based education funding system for this country through a combination of additional state and federal funding. In the 2013 federal election, the LNP went to the election on a so called “unity ticket” with the ALP government on school funding. They lied. No sooner were the LNP elected than they attempted to repudiate the “unity ticket” and the model that had been put forward. In the face of public uproar, they relented, but only to the extent of funding the first four years of the six-year phase-in, when the big increases were in years five and six. Last year, they rejigged the model and provided some additional funding, but still with a significant gap between their current model and the “unity ticket” they promised. The claim has four components. An additional $1.9 billion for state schools across the country for 2018 and 2019 to replace the Turnbull government cuts. All schools to be funded to at least 100 per cent of the schooling resource standard (SRS) proposed by the original Gonski Review in 2011 and legislated into federal legislation by the Gillard government. On current figures, by 2023 87 per cent of Queensland state schools will still be funded below the SRS. A federal government capital fund for state schools. There is $1.9 billion for capital works in this year’s federal budget, much of which is for rich private schools. There is nothing for state schools. More support for students with disabilities. There was some additional funding for students with disabilities, but when the Nationally Consistent Collection of Data revealed higher numbers of students with a disability, the funding was not increased but spread more thinly instead. We have been robbed. The Abbott and Turnbull governments committed the crime, but Ministers can still repent and change their minds. The ALP has already and repeatedly promised to restore funding to the original total by adding $17 billion over the next 10 years. When we talk about millions and billions, it’s often very difficult to conceptualise. Here’s how you can break it down. In Queensland, across the state system, there is $250 million in Gonski additional funding that we know as Investing for Success (and previously as Great Results Guarantee). Each school has an allocation, based on need, that you can identify at a school level. It pays for a range of things, including employment of additional teachers and teacher-aides. It is our money – money we won for state schools through our campaign. If we win the Fair Funding Now! campaign, you can DOUBLE that amount. Imagine what can be done to address need with those additional funds. At the heart of the original Gonski report and the needs-based funding model it proposed is an international definition of equity: that differences in educational outcomes must not be the result of differences in wealth, income, power, or possessions. “Ensuring that all Australian children, whatever their circumstance, have access to the best possible education and chance to realise their full potential can also be considered the moral imperative of schooling” (Review of Funding for Schooling, 2011:105.). If you want to be part of this campaign (and who would not), go to the Fair Funding Now! website and sign up to receive updates and volunteer. The QTU, together with other state and territory branches of the Australian Education Union, will be campaigning for fair funding right up to the next federal election, whether it is held in August this year or June next year. We have the capacity to change the future of state schools and their students. Don’t be a spectator.